The start of a new term felt like a good time to freshen up some of the rewards we sometimes give to the children. It’s really helpful sometimes to be able to break up a heavy morning’s study with a little something pleasing. For the last couple of years, this book – which I thoroughly recommend as it has been excellent value! 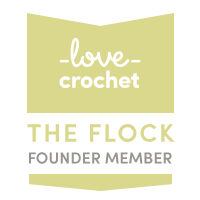 – has provided our go-to reward when the kiddies are spontaneously helpful or make a big effort with something. 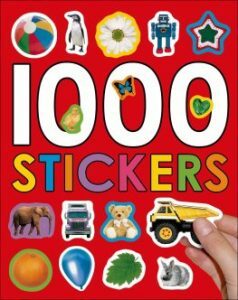 The kiddies (now 10, 8 and 5) area allowed to get the book from its special place and choose any page they like to complete, which they all enjoy. 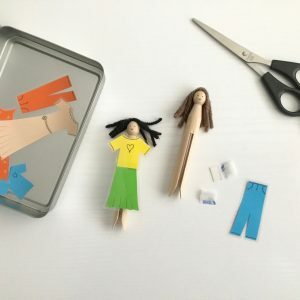 I wanted to create an alternative to this and I came across this quick peg doll idea on the ‘And Next Comes L’ blog and thought it would be perfect – and all from things I had around the house! 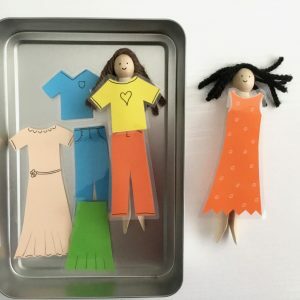 I have made more elaborate peg dolls before, with scrap-fabric clothes and pipe-cleaner arms, but the fun and attraction of these is the ease with which their clothes can be changed. 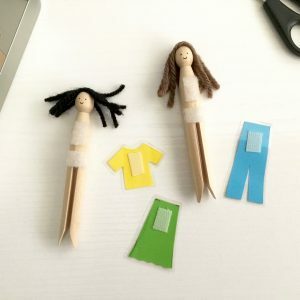 I glued some yarn scraps to the top of a couple of pegs and added face details, plus one side of some self-adhesive velcro. 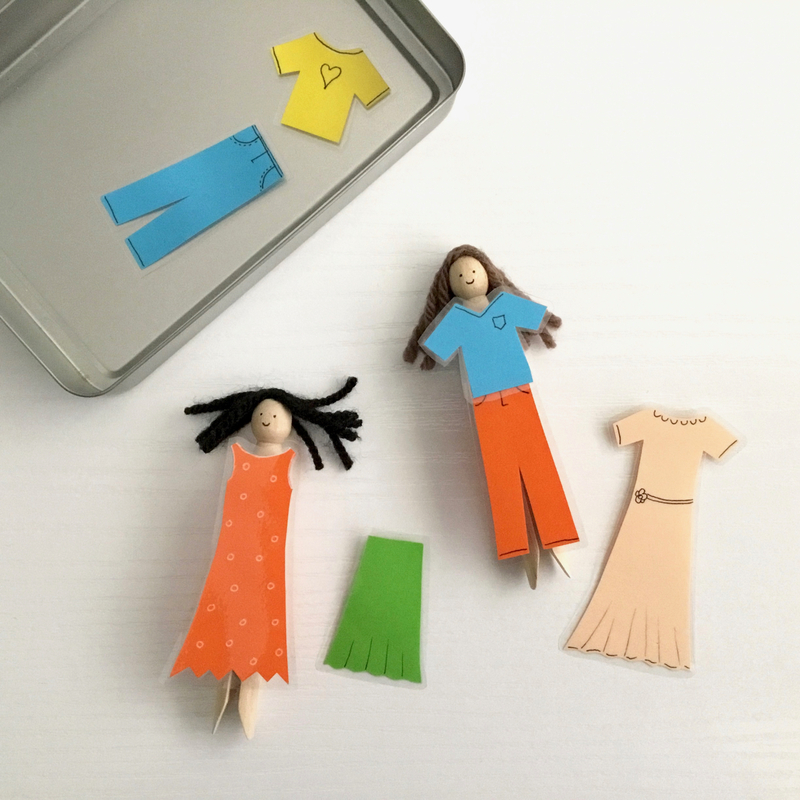 Then I cut some clothes out very quickly from coloured paper and added a few elements in black pen. I laminated the clothes and added opposite pieces of Velcro to the back of them. It’s the ability to quickly and easily change clothes that makes these particularly attractive to the kiddies. 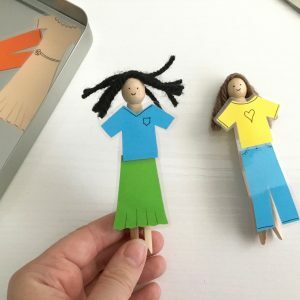 I’m going to make some more clothes when I’m next laminating something – and the kiddies could make some too. 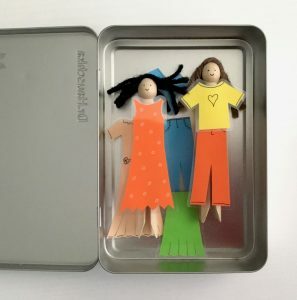 I just happened to have the perfect little tin to keep them in, and it’s the fact the dolls are secreted away like this, and only come out rarely, that makes them seem special to the children. See my next blog post for more ideas to go in little reward boxes.